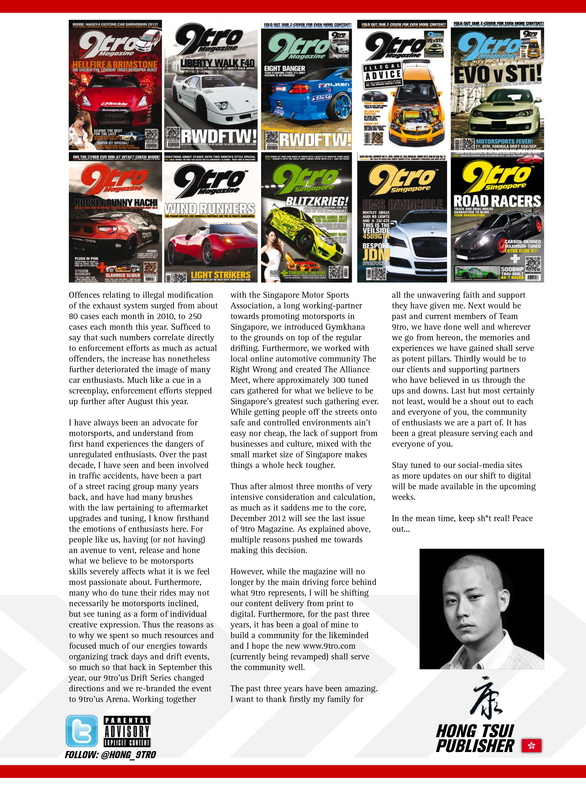 The first issue of 9tro Magazine was published and distributed on May 2010, six months after the company was formed, a highly anticipated (and needed) energy-surge for the automotive aftermarket tuning and motorsports industry here in Singapore. As a young company that believed (and still does) in constant upgrades and improvements, we strived for never-ending improvements and innovations, evident in every subsequent issue of the magazine. Originally introduced with a dual-cover format, with ‘9tro – Gold Edition’ on one side and ‘9tro – Black Edition’ on the flip side, the latter was renamed four issues later as BLACK Magazine, and further graduated into a separately-printed magazine on May 2011 (both magazines were bundled and sold as one package). These two publications served as the core of the business, and while both printed magazines focused on motorsports and automotive tuning, BLACK Magazine which focused on the European and high-end market was also well known for its in-depth new car reviews, as well as its strong lifestyle section. 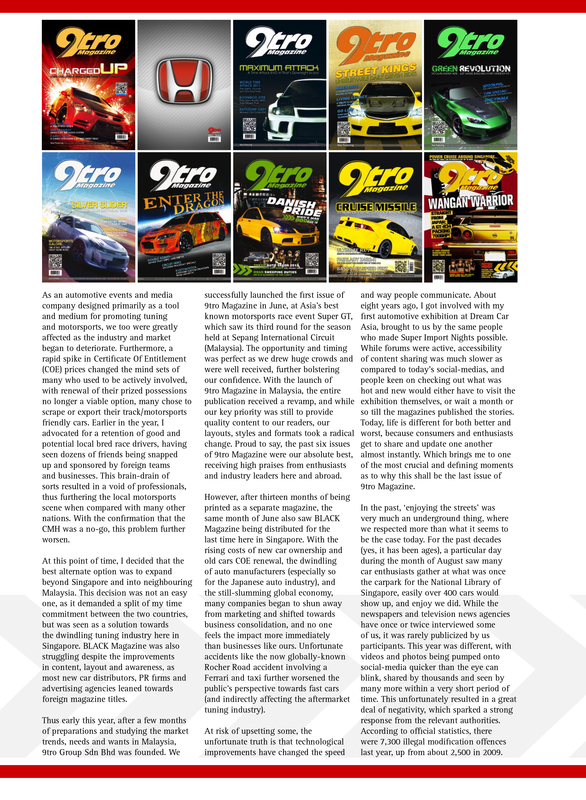 9tro Magazine on the other hand, focused more on the Asiatic manufacturers, and was highly regarded by industry leaders and consumers alike as the best automotive-enthusiasts magazines coming out of Singapore. Two synergistic and supportive divisions were added in early 2011 to the ‘Media Division’ which focused on information and content dissemination. While the ‘Motorsports Division’ laid the path for motorsports involvement and participation, the ‘Events Division’ concentrated on the conceptualization, creation and participation of relevant events. In early 2012, the company expanded beyond the shores of Singapore into neighbouring Malaysia, setting up 9tro Group Sdn Bhd to service clients and readers directly in Malaysia. Furthermore, the penetration allowed for stronger ties with businesses, consumers, alongside events and motorsports organizers, solidifying the company’s position in the market. The magazines were also the first in the region to be made available on mobile platforms (Apple, Android, etc…) back in late 2010, which began with a SingTel app collaboration (De!ite). 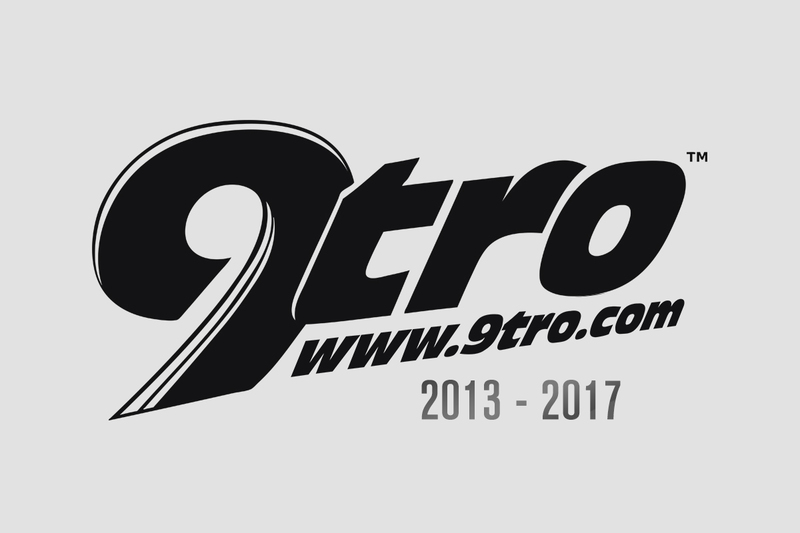 The 9tro brand then moved further into the international scene via a collaboration with Magzter a year later, allowing for the magazines to be distributed onto more digital platforms (Mac, PC, etc…). 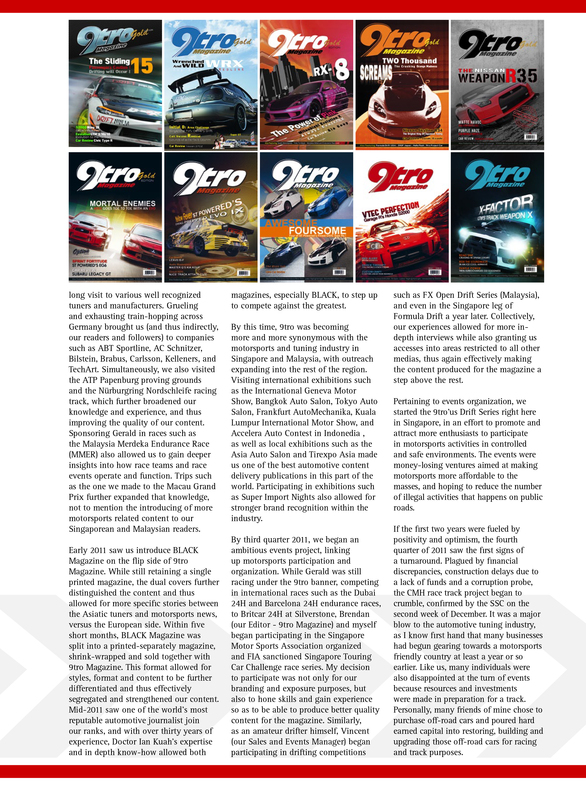 In print format, a strong and effective relationship was forged with Singaporean and Malaysian distributors, MediaCorp and Central Papers respectively, making us one of the best circulated automotive magazines in both countries. Every cover of 9tro and BLACK Magazines. With the undeniable and obvious shift in consumer habits, the dwindling attractiveness of print media in favour of all things mobile and digital propelled the company to shift gears in late 2012. 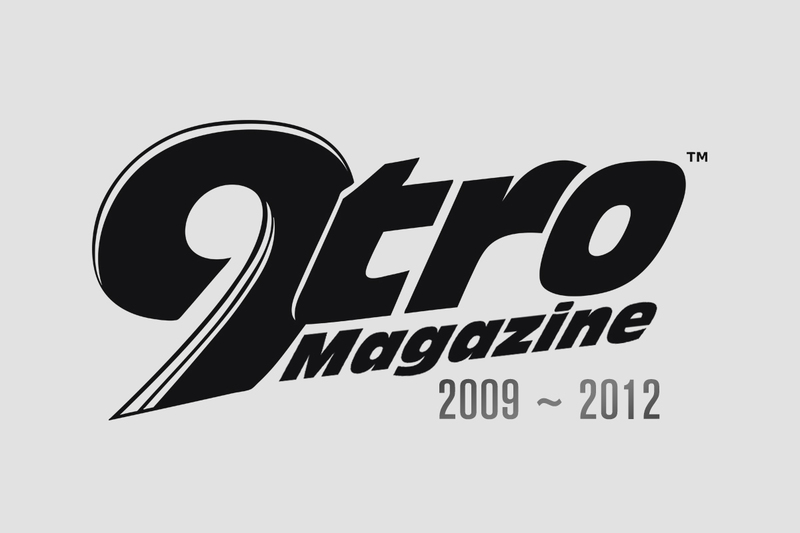 June 2012 saw the distribution of the last issue of BLACK Magazine (Issue 21), and six months later, the distribution of the last issue of 9tro Magazine (Issue 26). Planning for the shift into a full-on digital automotive media began in late October 2012. “The past three years have been truly fantastic, we gained experiences never before imagined, made new friends from all around the world and fostered relationships that I believe will last a lifetime. We have made automotive history in this part of the world, and even if the magazines are no longer in production, the brand will live on digitally. Aston, Albert, Alex, Adam, Benjamin, Bear, Brendan, Carol, Casey, Cheryl, Dayya, Darren, Damion, Dino, Eik, Eqi, Fiona, Eng Siang, Fana, HuiQi, Ian, Irving, Jo-Lynne, Jay Joel, Jhem, Jun Hong, James, Kristine, Melvin, Matthew, Praveent, Reg, Sam, Shai, Sandy, Steven, Vincent, Yim and Yaya. (Below) Read a more concise history on 9tro, in Hong’s last Editorial Note published in the final issue of 9tro Magazine in November/December 2012.